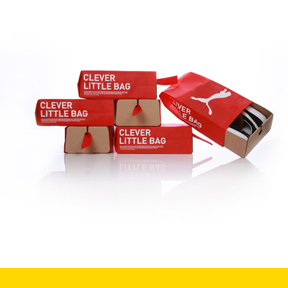 The Clever Little Bag is the sustainable evolution of the traditional shoebox. A cardboard sheet folds into a box structure, which holds the shoes and fits seamlessly into a cloth bag. This system, which replaces the need for a plastic retail bag, uses 65 percent less cardboard than the standard shoebox, takes up less space, weighs less in shipping and is completely recyclable.